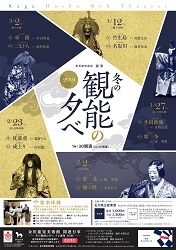 Full-fledged traditional art performances of Kanazawa, “Kaga-Hosho style of Noh” are presented in public with very reasonable admission fees every winter. Tickets on the day are sold at the theater. English program is available. 冬の観能の夕べ2019 The free paper for the person who came to Kanazawa published.